As we serve together here in Peru as your faithful partners in the Lord, we endeavor to stay busy about the Master’s business because as the verse above states the days are evil. This summer has been no exception with many opportunities and needs. Camps and Conferences: This summer has been filled with activities and excitement. In January, I had the opportunity to preach at family camp in Trujillo. That was a blessing as campers responded to the preaching and teaching and many decisions were made. In addition, the last week of January and the first week of February we held our own camps (first in almost 17 years), one for the deaf and one for the hearing. What a great blessing as we saw deaf and hearing people saved and lives changed during these camps. Folks who came from other churches said it was the best camp they have attended and are looking forward with anticipation to next year’s camps. Last week we also held our Fires of Evangelism conference. This year it was held at the Baptist Bible College here in the north of Lima about two hours from Efata. What a great blessing that was, as over 40 pastors came to the workshops and over 400 people attended each night. During the final evening invitation, over 40 young people and adults came forward and publicly dedicated their lives to the Lord. Please pray as we are planning for the 40th anniversary for Efata, May 17-21, that it will be a great encouragement to our church and that we’ll see many saved. Salvations & Baptisms: Many people have been saved during these past months. 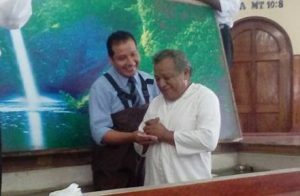 This past Sunday we baptized several people from Efata and our mission church in Tablada. One was the older brother of two of our pastors on our staff. He was the last of his siblings to be saved and baptized. They were so excited and it was wonderful to see all the brothers and sisters come to attend the baptism. It was great to see this group of new converts and other Christians respond to the Lord’s command for baptism. Home Ministry: We continue to receive a steady stream of babies and children who pass through Efata on their way to their orphanages. We have helped as a transitory home for these children who are abandoned or taken from abusive situations. Most are babies or young children but we occasionally get a child who is older, of whom many have been saved through this ministry. One such child was an eleven-year-old girl who recently came and stayed with us for just one night. We may never see her again on this side of Heaven but we will see her there! Infrastructure: Recently the city paved our streets and put in sidewalks. We have been waiting years for this. The neighborhood looks a great deal better now. We are praying for funds to repair and restore our complex security wall and doors. If you or your church can help us with that project it would be a blessing and good testimony to our area. Future church plant: We have purchased a plot of land for a future church plant two hours north of us in a new urbanization area where there are no Baptist churches. It is in an area that is slated for much growth because of a new super port for shipping that is going to be built. The plot for the church cost about $8900 (about $2 a square meter). The value of this land has already gone up. Would you please pray about helping with this cost? We are planning to raise additional funds to prepare the land and build a simple structure where we can hold services once we begin the evangelization process in the area. Please continue to pray for us and our ministry to the Deaf and hearing. God is using Efata in a great way here in Peru and beyond. Police Work: Please continue to pray for this area of ministry that we are trying to develop. Every time I believe we are making advances, it seems things grind to a snail’s pace. I had a meeting with a key Colonel who currently oversees the Department of Wellbeing for the national police which oversees the Chaplaincy. He really liked my proposals for a volunteer chaplaincy corps to augment the official Catholic chaplains. He is working on getting another meeting for me with the Director of the National Police. I will keep you advised. Judson is in boot camp at Parris Island for the Marines. Please pray for him as it is tough going but he is determined to become a Marine. He will graduate April 28th. Lisa and I will be going to the graduation. Jared will be going into the Air Force on April 11th. Both had very high ASVAB scores and were able to get great jobs in the service. Pray for them as they embark on this new chapter of their lives and that God will use them in His service as well. Our five youngest children are doing well and are back into the school routine. Joy and John both went forward in the conference to dedicate their lives to the Lord. What a blessing that was. Congratulations to my wife Lisa, who turned 50 this month! I thank God for her and for her love. I wouldn’t be here today without her. Thank you all for your faithful prayers and support. God is doing wonderful things through our partnership. © Copyright 2012-2014 The Kotvas Family. Site by Joseph S Kotvas.